Soup is cool. And in this case, chilled. Which is perfect for the warm weather we’re having in our part of the world. We particularly like this dish because it allows us to use some of the fresh, ripe strawberries that are showing up in our market. Fruit is inherently sweet, of course. But add a bit of sourness (balsamic vinegar) and spicy heat (chipotle), and you have a savory starter. Best of all, you can make this dish a day ahead. So any time you’re ready, soup is on. We got the idea for this soup when we were working on our recipe for Strawberry-Chipotle Salsa with Jalapeño. But for soup, we wanted something with less kick and richer flavor. So we dropped the onion and jalapeño, and added OJ, sour cream, and mint. The result is a smooth starter that will wake up your taste buds for the meal to come. Prep time for this dish is about 15 minutes. You’ll also want to let the soup chill for at least an hour before serving. Or even chill it overnight. Leftovers will keep for a couple of days if refrigerated in an airtight container (the soup will be “good” for longer than that, but its flavor will deteriorate). Wash and hull the strawberries. Set the berries aside, reserving a few for garnish. Add the chipotle pepper(s) to the bowl of a food processor. Add the adobo sauce, balsamic vinegar, and orange juice. Process for a few seconds until the chipotle pepper is well blended. Add the sugar (if using) and the strawberries. 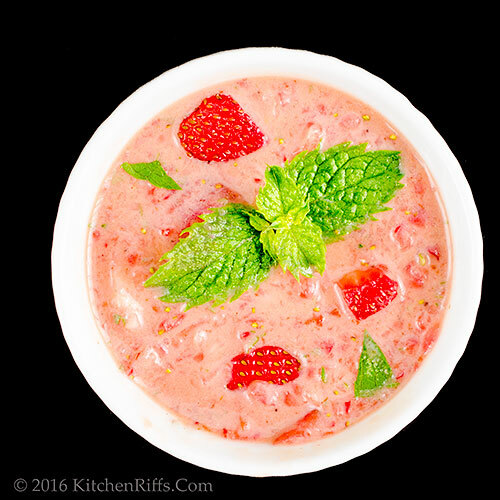 Process but don’t liquefy the strawberries – you want them to retain considerable texture. Using a spatula, scrape the mixture into a storage container that can be made airtight. Stir in the sour cream, yogurt, or crème fraiche (but see Notes; you may want to do this later). Cover the container tightly and let the soup chill in the refrigerator for at least an hour. Right before serving, wash the mint and chop it finely. Stir it into the soup. Dish the soup into serving bowls. Garnish with mint (chopped or whole) and/or chopped or sliced strawberries. 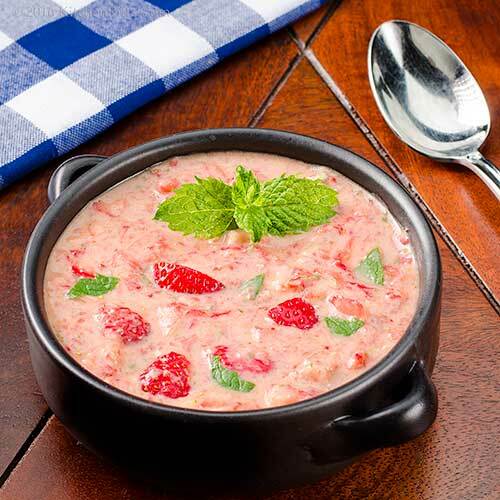 You may not need to add sugar to this soup if your strawberries are ripe and sweet. Or you may need to add more than we specify. If in doubt, skip the sugar. Taste the soup after it’s been chilled, then add sugar if necessary. BTW, honey makes a good substitute for sugar in this recipe. We generally use two canned chipotle peppers in this soup. We like spice, so that suits our taste. We notice the ping, but it’s not overwhelming. To us. If in doubt, start with one chipotle pepper. Do note that the longer the chile steeps in the soup, the stronger it becomes. So if you make this a day ahead, the soup will be spicier than if you make it, chill it for an hour or two, then serve it. In the US, canned chipotle chilies tend to be sold in 7-ounce containers. The adobo sauce they’re packed in has a tangy vinegar flavor. What to do with the leftover chipotle peppers (you’ll only be using part of the can in this recipe)? We place the rest of them in a small airtight container and store them in the refrigerator until we have another use for them. They’ll keep for weeks. Fresh-squeezed OJ is wonderful in this soup. But bottled “fresh” OJ works too. If you want a more liquidy soup, you can increase the amount to 1½ (or even 2) cups. If you do that, you probably won’t need to add sugar. And you may want to use a touch more vinegar. If you want to intensify the orange flavor of this soup, you could float a teaspoon or two of Grand Marnier liqueur on top of each bowl right before serving (apply the liqueur before you add the garnish). Or stir a couple tablespoons of liqueur into the soup just before you ladle it up. We love to combine strawberries with balsamic vinegar. And vanilla-flavored balsamic is particularly luscious in this dish (the one we used adds fig to the mix – which makes for a fun flavor). You can increase the amount of balsamic vinegar to 2 tablespoons – it won’t be too much. At least we don’t think so. But let your taste buds rule. We haven’t tried it, but you could probably substitute lemon juice for vinegar if you prefer. The fruit/vinegar combo is an old one. It was popular during the 17th and 18th centuries in both Britain and colonial America. Vinegar also was sometimes used to preserve fruit. In America, cooks often made syrups from vinegar and fruit. There is a whole class of cocktails called “shrubs” that use vinegar/fruit syrup as an ingredient. We like to add the sour cream, yogurt, or crème fraiche to this soup in Step 3 (so its flavor has time to mingle with the strawberry mixture). Do be aware, though, that the addition will turn the intense red of the strawberries into a more muted, orangish color. If you want the strawberry red to be more apparent, you could add ¼ cup of sour cream, yogurt, or crème fraiche to the top of each bowl (as a garnish), and then let your guests stir it in with their soup spoons. We haven’t tried it, but we think that savory whipped cream could make an interesting substitute for sour cream. You can find instructions for making it in our recipe for Asparagus with Savory Whipped Cream. “Yeah, I better chill on the 1960s references,” said Mrs K R.
“Don’t wanna sound cold and old,” I said. “Fortunately, this soup is cold and bold,” said Mrs K R.
“What’s that, chill girl?” I said. This soup is just beautiful! I love the idea of a cold strawberry soup. Hi Karen, this is wonderful! My new favorite recipe. :-) Thanks for the comment. Now this is beautifully original. The Minnesota strawberries come in during June and I will be making this. I haven't cooked much lately and am actually looking forward to getting back to the grind. Love berries and vinegar. Really love the chipotle flavor. Hi Claudia, berries and vinegar are an awesome combo, aren't they? And with chipotle? Swoon! :-) Thanks for the comment. What a unique and lovely pairing of fresh strawberries, chipotle peppers, adobo sauce, balsamic vinegar, OJ, and mint! Delicious and so delightful! Loving the color too! Well, that was mighty creative turning a salsa into a soup. :) I love it! I think mint is such an underrated herb and I love seeing it used in abundance here. And to pair it with chipotle sounds very interesting!! Hopefully it will get warm enough soon to actually want cold soup. I'd love to try this because the flavor profile is so unique. Great job John!! I grew up in U.City. Tell me more about where you live! Hi Shashi, isn't this a fun dish? Really good flavor, and something a bit different. :-) Thanks for the comment. Hi MJ, mint grows like a weed in our yard, so we're always looking for a new way to use it! Love its flavor. Bet you'll like this soup. And you may want to add 3 chipotle peppers. :-) Thanks for the comment. Spicy Strawberries?!?!?!?! What in the what?! Hi GiGi, :-) Spicy = good! Thanks for the comment. I think yes on the Grand Marnier and the soup! 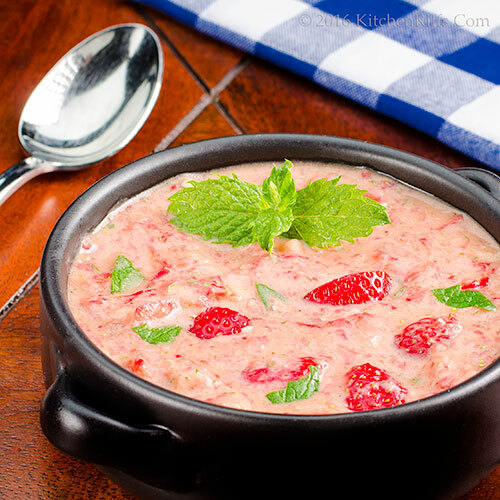 I love strawberry soup and am very intrigued with your chipotle version. What a great combination! Have a Happy Memorial Day! Yay for strawberry season. We just attended a party this past Sunday where one of our friends brought a strawberry jalapeno fennel salsa. It was really an interesting combo, in a delicious way. Hi Tricia, we'll almost never say no to Grand Mariner. :-) Happy Memorial Day, and thanks for the comment. Hi Lea Ann, love the idea of fennel in a spicy strawberry salsa! Going to have to try that. :-) Thanks for the comment. Hi Robyn, strawberry soup without the heat is awfully good, but trust me, this is better. :-) Thanks for the comment. The weather here feels like July! This soup would be a delightful summer meal! Hope you and Mrs. KR have a lovely holiday weekend. Hi Liz, it does feel like July! Hence, this soup. :-) Thanks for the comment, and have a wonderful Memorial Day! Yes, I'll go for adding the splash of Cointreau on top of the soup. I remember when Dustin Hoffman referred to the phrase "you can't trust anyone over 30" after his movie, The Graduate" came out in 1968. He was 30 then, now he's pushing 80- time sure does fly! How exquisite as a summer soup, John. What a great soup, I have to try it. I always freeze my leftover chipotle pepper . I put each one with some of the juice in a plastic sandwich bag. Have a wonderful Memorial Day weekend. PS: I love the soundtrack to the Big Chill! Hi Fran, time does fly, doesn't it? 30? That's a mere babe! :-) Thanks for the comment. Hi Lizzy, it is, it is! :-) Thanks for the comment. Hi Gerlinde, that really is a great soundtrack, isn't it? Freezing leftover chipotle is a good idea -- I'll have to try it. Although I go through it so quickly! Thanks for the comment. 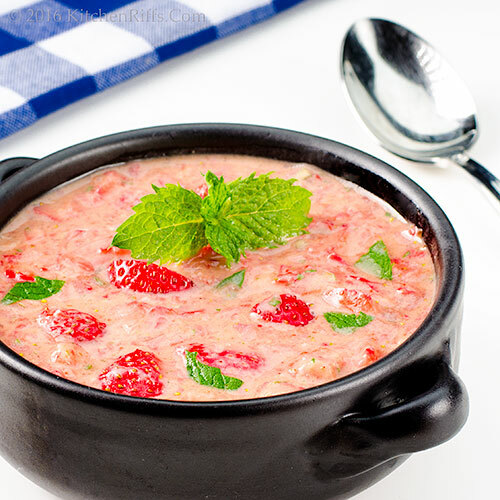 Hi John, I am loving everything strawberry right now, this looks like a great soup, chilled and flavorful. Hi Cheri, we're really feasting on strawberries too! SO good this year! Thanks for the comment. Hi Louise, birthdays are indeed on the horizon! So that new motto makes sense. :-) Thanks for the comment. Hi Dottie, cool indeed. :-) And this is so worth trying -- a bit spicy, but really tasty. Hope your weekend is great, and thanks for the comment. I think I need to come to your party! Hot chipotle, chill soup, cool vibes. Just wish the chill in our air would disappear so I can sit outside and sip on this. Now that would be chillin'! Just love the sound of this delicious cold soup. This looks so vibrant, filler and refreshing. A prefect treat for this slightly warm weather we have here. Wow, what a beautiful looking soup! I never thought of adding strawberries in the savory and spicy dish but I can imagine it will be so refreshing. Hi Abbe, we specialize in cool vibes! :-) You've had a really chilly spring, haven't you? More chili weather than strawberry soup weather. Thanks for the comment. Hi Anu, isn't this a fun soup? So full of flavor! Thanks for the comment. Hi Holly, strawberries and savory really are nice together. So many different things you can do with them! Thanks for the comment. Hi Denise, this really is a wonderful dish! We finished off the leftovers last night. They were a few days old, but still tasted great! Thanks for the comment. Lots of good things going on here, John! This is one delicious looking soup to try, and it's pretty too. Another great use of strawberries! That's an interesting soup. Never seen anything like this. A wonderful combination of flavours and ingredients. Your recipes are always so innovative and delicious. Love the color and how beautiful it looks. Can't wait to try this out. Thank for another lovely share ! This is a super cool and unique recipe. I love cooking with fruit. It is far more versatile than people realize. Sounds refreshing and delicious... perfect for strawberry season! Hi Pam, one can never have too many uses for strawberries! Thanks for the comment. Hi Rosa, it has a really interesting flavor -- SO good. We love it! Thanks for the comment. Hi Kushi, this is fun stuff! And tasty, too -- always the most important thing. Thanks for the comment. Hi Greg, you can do so much with strawberries, can't they? They take so well to so many different flavors! Thanks for the comment. Hi Laura, agree that fruit is so versatile. It's fun in sweets, but even better in savory dishes. IMO. :-) Thanks for the comment. Hi Pam, we've got tons of great strawberries available at the moment, so we have to do something with them! :-) Thanks for the comment. This soup is right up my alley and it looks so tasty! Strawberry salsa and now this? I bet the sweet strawberries marry perfectly with the chipotle heat and the sweet-savory-umami balsamic. Hi Marcelle, chilled fruit soups are wonderful, aren't they? Love the combo of sweet and spice in this one! Thanks for the comment. Hi Peachy, you'll like this! Really good stuff. :-) Thanks for the comment. Hi Debra, can't resist the strawberry/chipotle/balsamic trinity. As you can see. :-) Thanks for the comment. 1960s references? How about Strawberry Alarm Clock, or Strawberry Fields Forever? Hi Beth, the more 60s reference the better! :-) Thanks for the comment. Hi Ala, strawberry and mint really are cooling, aren't they? Much needed with the chipotle! Thanks for the comment. Hi Anne, we're definitely into cold soup season! Really hot here today -- summer has arrived. Nice, though. Thanks for the comment. This is a beautiful soup and would be perfect for a dinner party! Hi Chris, isn't this nice? Pretty and really tasty! Winner. :-) Thanks for the comment. Oh I want a bowl RIGHT NOW, actually a bath cause we are in a heat wave in my part of the world. Love summer berries and love to try cold soups. A little heat here is perfect too. Great recipe John. Hi Evelyne, heat wave here, too. So this is MOST welcome. :-) Thanks for the comment. Love, love fruit soups. I never thought to add chipotle to add a bit of smoky heat to something sweet. Your soup is beautiful. Plenty of strawberries in season here...I may need to take a crack at this soup. Hi Velva, tons of strawberries here, too. More soup needed! :-) Thanks for the comment. Gosh, this soup looks so pretty! Pink! And I love soups especially on a gloomy day. Love! Hi Lux, this definitely is a soup you can love! SO much flavor. :-) Thanks for the comment. Now this is an interesting soup! Looks really pretty in that colour. Hi Raymund, isn't this fun? And loaded with flavor! Thanks for the comment. Wow John, this is the most beautiful soup I have ever seen...I love the idea of sweet soup...the first time I had a soup like this was in one of our cruises...and I totally forgot about it, until I saw your recipe...thank you so much for this post...especially that there are all kind of strawberries in the market. Hi Juliana, isn't this a wonderful soup? Really terrific flavor! Thanks for the comment. This would be awesome on a scorching summer day. Refreshing, palate-tingling and so very satisfying without making you feel weighed down. Plus, it's gorgeous to boot. Hi Carolyn, isn't this pretty? And tastes better than it looks! Thanks for the comment. I was like Gosh! when I first saw your soup... This combo is so unique, bold and cool!!! I love it!!! What a beautiful sweet soup! I love the idea! Hi Zoe, isn't this a fun dish? Really interesting flavor! Thanks for the comment. Hi Katerina, you'll love eating it, too! :-) Thanks for the comment. What a great idea for a soup! Strawberries always get used in the same old things but this is quite creative and beautiful too. Love the bold flavours! Hi Nazneen, the flavors in this are incredible! Really good stuff. :-) Thanks for the comment. This must be so refreshing! I'm really impressed by this creative soup - strawberry and salsa into soup! We can get really good strawberries now and such a wonderful recipe to enjoy them! Hi Nami, isn't this a fun soup? And so tasty! We're loving all the strawberries this season! Thanks for the comment. Yummy! The soup looks delicious! I have never heard of strawberry soup before. This sounds so, so good. I love it and can't wait to try it. Hi Mary, this is such fun soup! Tons of flavor, and so seasonal. Plus it looks great! Thanks for the comment. Wow strawberries in a soup!! you are really playing with your food John :), but I like that. This shows how creative you are my friends. Thanks for sharing your adventure. Hi Amira, we do like to play with our food. :-) Thanks for the comment. Hi Kiran, basically this IS a fruit gazpacho! Thanks for the comment. Hi John, very unique strawberry soup, something new to me.But it look very inviting and the colour look lovely too. Thanks for sharing this impressive recipe. Hi Amelia, this is SO worth trying! Really good flavor. We're having it again this weekend! Thanks for the comment. Yes, yes, and yes! Everything about this soup is spot on. What a fantastic combination of flavours and what a great way to cool down this summer. Thanks for sharing this great recipe John! Hi Nancy, isn't this a fun soup? We had it again for dinner this past Saturday night -- really good! Thanks for the comment. Hi Rosita, the color of this is really great, isn't it? As is its flavor! Thanks for the comment.